So, what did you think of the show? I am sad it’s over but I’m so grateful to have been a part of this amazing experience. Watch my recap for fun memories and hilarious moments from the show. You can watch the entire season on Amazon.com! Here is the link to my Thai-Inspired Grilled Beef Salad, which inspired the spring rolls I made in the finale. Thank you for all the support you’ve given me, I really loved hearing from all of you! Hi Amber, I’m a big fan. I was disappointed that you didn’t win, but was very impressed by your talent. I would have watched you or Sean, because of the Asian inspiration behind both of you, and I liked Helen, too. You guys sure seemed to bond. At any rate, you are a winner. Good luck-I hope we see you somewhere else in the future. Hi Amber, my name is Mia Scott. I’m 11 years old and I live in Akron Ohio and go to a small private school. My birthday is December 21st, 2002. When’s yours??? I love sports, especially soccer, though my favorite thing to do is cook!!! I mostly like baking, though I like cooking too!!!! Currently, I love zebra and giraffe patterns!!! My family and I eat very healthy and are also very active. I really enjoyed watching you on Rachael Vs Guy!!! You did great!!! I wish you would have won, though still happy for Gibson!!! You are such an inspiration to children and even adults!!! I would love too meet you some day!!! Where do you live??? Well, I know you live in Washington, though what part and what city??? How old is your sister??? She is adorable!!! I especially like the video with your sister, I think TMI Tagged!!! Can’t stop watching it!!! Who is your favorite chef??? Mine’s Giada de Laurentiis. Good luck, hope to see you on TV or somewhere else soon!!! Thanks Mia! My favorite chef is Giada too! I love Zebras!!! I am really happy for Gibson too! I am one of your biggest fans, and I was wondering if you could tell me how to get into Rachael vs. Guy Kids cook – off. 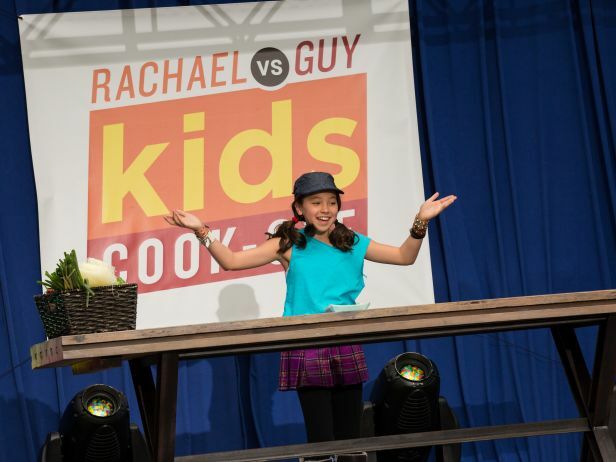 I recorded all the episodes of the kids cook off with Rachel and Guy, and you guys were amazing! Even though you didn’t win on the show, you have a good attitude about everything and are definetly a winner off the show 🙂 you have a talentS , keep it up girl ! Thanks so much for responding Amber!!!! I loved rvg. It looked like you had soooooo much fun. I actually learned about your website from food network. PLEASE POST MORE VIDEOS. I like them a lot. I like your online show!